If you’ve decided to run an online contest you’ve already taken the first step in the right direction. An online contest is a fantastic way to expand your brand’s awareness, engage with existing leads or customers and provides you with rich customer data to archive for the future. But, like in all aspects of life, people do make mistakes. Sometimes it seems as though if the company had made just one minor change, it could have made all of the difference. Wishpond experiences firsthand those contests that rocket to success and those that never seem to lift off the ground. And we usually know why. It’s time to find out the 5 biggest contest mistakes we see all the time so you know exactly what NOT to do to ensure your campaign leads you to success. Wishpond contest apps are one of the easiest ways to generate buzz around your brand on social as well as generate valuable, quality leads. Sign up today! When it comes to contests, there are tons of possibilities (our platform alone offers 10 varieties). Sweepstakes, Photo Contests, Essay contests or Hashtag contests, each type requires a different level of involvement and effort from your fans or followers. Put yourself in your fans’ shoes. You’re scrolling through Facebook and come across two different contests. One, a simple sweepstakes, and the other a video submission contest. Obviously one takes about 20 seconds to enter while the other would involve at least a few hours of filming and editing. You would expect these to have very different prizes based on the relative effort and time exerted. We frequently see Facebook photo contests where participants need to submit their own photo (and sometimes a description) to earn a simple $25 gift card. For someone to take enough time out of their busy life to upload a photo, you need to offer them the chance to win a bit more than that. Don’t get me wrong, there’s nothing wrong with a $25 gift card, but that prize would much better suit a vote or sweepstakes contest with a lower barrier to entry. For a photo contest our recommendation is always a prize of at least $100 value. Contests involving user-generated content (UGC) like essay, photo, pinterest, music or video contests reward you with highly engaged leads but they come at a cost, and require much larger prize values. Before you launch your contest, take a minute to think about how much time and effort your fans will need to exert to enter, and decide on your prize accordingly. When a potential entrant views your contest page, you have 7 seconds to explain exactly what the contest is and what they’ll win. 7 seconds. And realistically, in those 7 seconds your potential entrant isn’t going to be reading any text. They’re going to be judging you and your contest based off of visuals. Businesses constantly make the mistake of not using images of the prize itself. Such a simple mistake makes steam blow out of our ears as an easy image swap could make all of the difference in the number and quality of submissions. Your prize is the most important feature of your page. In those 7 seconds you want to lure entrants in with the possibility of having that prize in their own hands. The best way to do so is to display an image of it loud and clear. That image should also be accompanied with bold text outlining what the prize is. You can never be too obvious when it comes to displaying your reward. A great example of displaying a prize can be seen below. 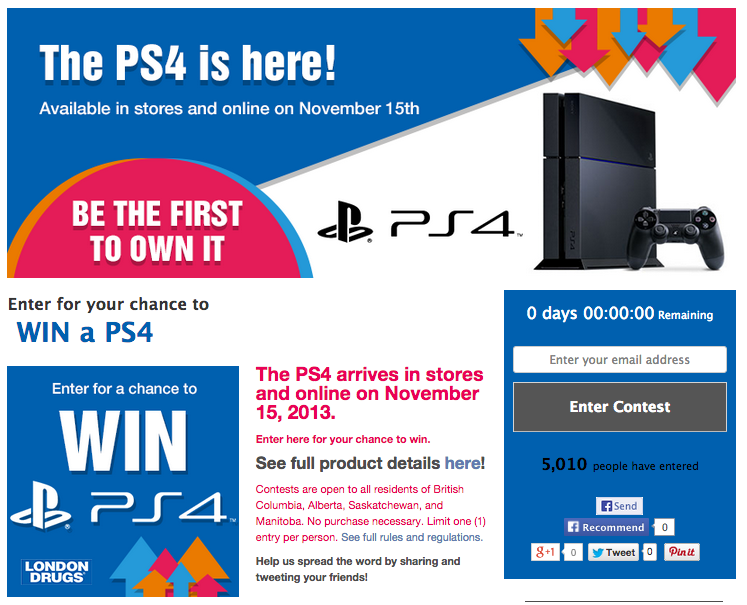 London Drugs has created a great visual presentation of the contest with the prize, the PS4, front and centre. It’s literally impossible to not understand what the winner will be rewarded, just as it should be. In this case, majority of individuals know the approximate value of a brand new PS4. But if the value of your prize isn’t common knowledge to the audience you should also place its dollar amount on the contest page. An example of this can be seen in the My Jewelry Box example below. They have shown the retail price of the ring to convey the high value of their prize. Contests are not one of the hardest ways to gain new leads or potential customers for your business, but don’t for a second think that means they require little effort. One mistake many people make is thinking that once the contest is launched it will do the rest of the work on its own. Unfortunately that is not the case. A successful contest requires constant maintenance to ensure it’s running properly and that you are consistently gaining new entries. You also need to be altering your promotional efforts and increasing your ad budget when necessary. We tell all of our clients that the biggest thing to remember is that you can never under promote a contest. If you can think of a contest promotion idea that you’re not currently doing, get started right away. We recommend linking to the contest from your blog and website and promoting it across all of your social media channels. In addition, Facebook Ads are the best way to specifically target your core audience. You can target individuals based on their age, gender, marital status, occupation, interests on Facebook, places they have been tagged and many other options. 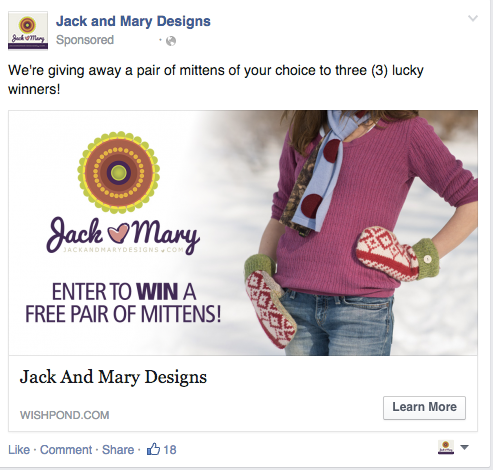 A great example of using a Facebook Ad to promote a contest can be seen below from Jack and Mary. They have shown this ad to women in their demographic, many of whom may not know of the brand, expanding their reach to a new group of potential customers. 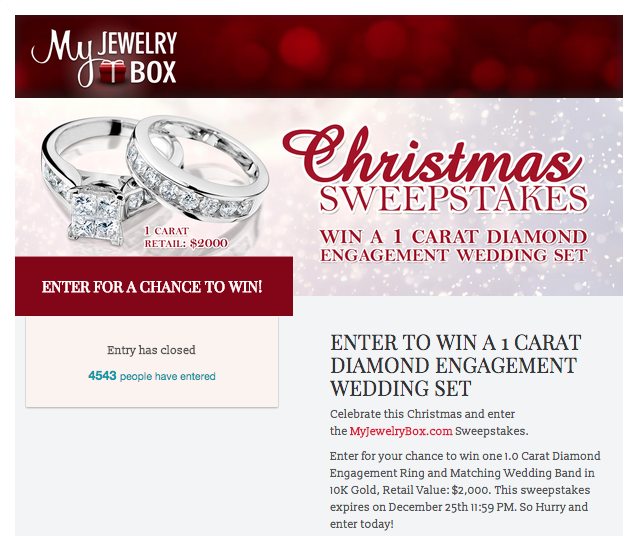 Another option is to use a popup on your website promoting your contest. You can choose to have an entry, exit, scroll, timed, or click popup displaying the prize and informing web visitors about your popup in a creative, hard-to-miss way. (For more on popups check out our article “ Should you use Popups?” or download our free ebook for popups). Use as many communication outlets as possible to inform current and potential customers about your contest and change it up throughout your campaign to reach new groups of prospective entrants. Sharing your contest with the social world is great, but you need to be cautious that you don’t overdo it. Excessive sharing occurs when the business gets hung up on the idea that promoting the contest means asking all of your fans and followers to share the contest with their own network every day. Not the best idea. Sharing is great, you should encourage it. However, don’t make it the biggest part of your promotional strategy. You want engaged clientele to be aware of the contest, but you don’t need it spammed all over the web. When deciding on a prize for your contest, you must must must ensure that it is relevant to your business. I’m that emphatic only because the most common argument we hear from the anti-contest crowd is that they don’t result in any real-world changes. Most commonly violators of the rule above are giving away the beloved Apple product or a bucket load of cash. And yeah, they’re great prizes… but they’re almost never relevant to the business giving them away. One example was a client of ours who was very well known as a public speaking and motivational life coach. Rather than giving away a free hour long session or copies of her books she chose to give away an iPad. An iPad is a great prize if you’re Best Buy, Apple, or another electronics store. But for our client an ipad does not tie into her products and services and isn’t connected to her brand. The result was that she got a high volume of leads but almost none of them clicked through to her website or engaged with her once the contest had ended. If you’re just looking for a high number of entries, general products or cash prizes are fine. But if you want to gain the best value out of your contest you should instead be thinking of prizes that are relevant, useful and valuable to your target audience. We always recommend that companies give away gift cards to their business (to encourage future purchasing) or products or services that they sell. A great example of a prize relevant to the brand can be seen below from Canadian Pacific Railway. 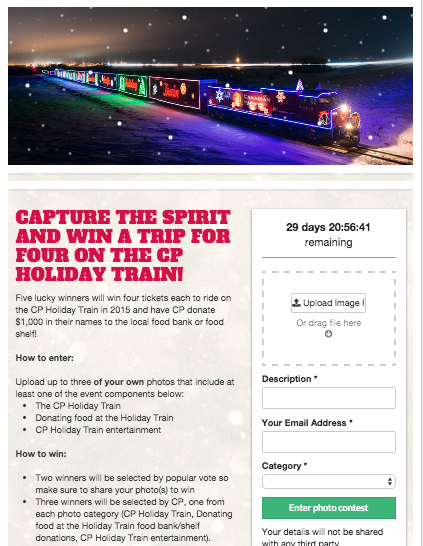 They ran a photo contest where participants could win 4 tickets on the CP holiday train. CP giving away money or an iPad would do nothing for their brand. A trip on their train actually connects entrants to the business, strengthens their reputation, and increases the chance of a loyal customer. We also love that it tied into the holiday theme, creating more desire as a fun, family event during the most festive time of the year. A contest is one place where you’re not going to want to shoot for the stars from the get-go. We frequently see businesses try to create high levels of engagement with a fan base out of the blue. Plain and simple this isn’t going to work. Don’t get me wrong, contests are one of the best and most proven ways for small to medium sized businesses to broaden their brand awareness, increase their social media presence or boost sales during the holidays. But it’s crucial that you plan your contest based off of your fan base’s engagement level with your brand. Most businesses starting out in the contest world have a fairly new or small following who have little interaction with the brand. In this case the business needs a contest with a low barrier of entry. A small clothing store with a thousand followers or web visitors shouldn’t start out by asking for fans to upload videos of themselves and why they love the brand. For Starbucks or Lululemon this would be a fantastic contest idea, but not for a business of this scale. This small business should start out with a simple vote contest or sweepstakes, and build their interaction and engagement. Over time they could progress into contests with more user involvement like a photo contest. Start slowly, and remember it’s okay to be the tortoise in this situation. When it comes to running an online contest there are a lot of factors to consider. But, with the right effort and advice they are one of the best ways to engage and excite new and current leads. Have you ever run an online contest? What hurdles did you encounter or mistakes did you make along the way? Feel free to share below!